How does the Ramadan fast affect tourists traveling to the Imperial Cities, the Sahara Desert and other regions of Morocco during this high holy holiday? Can tourists eat or drink in public during Ramadan? This article should clear up the confusion on this issue for tourists, to explain the most polite solutions for tourist behavior at this time, and to assure tourists that there is no problem with them visiting Morocco during Ramadan. Because the Islamic calendar is lunar, holidays such as Ramadan advance by approximately ten days with each subsequent year. 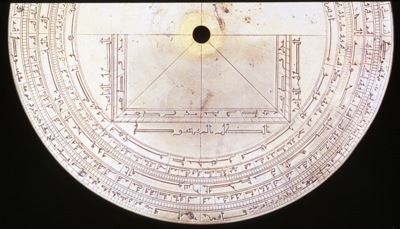 This means that Ramadan makes a cycle through the entire calendar of twelve months each twenty-some years. 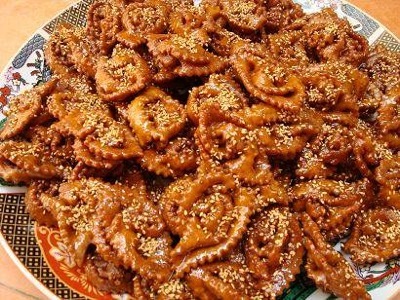 This year, Ramadan started on August 12th, 2010 in Morocco. 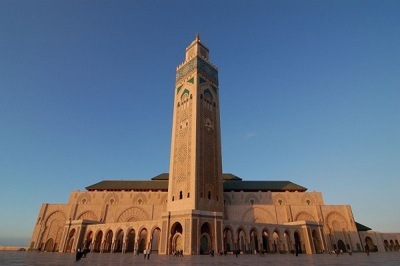 The fast presently starts in Morocco at approximately 4:30 AM, and ends in the evening at approximately 7:30 PM. 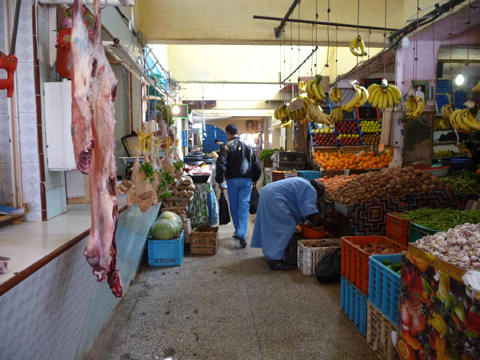 Tourists in Morocco during Ramadan often hear that some people are not required to fast because of sickness, or health conditions such as diabetes, as well as women having their menstration. 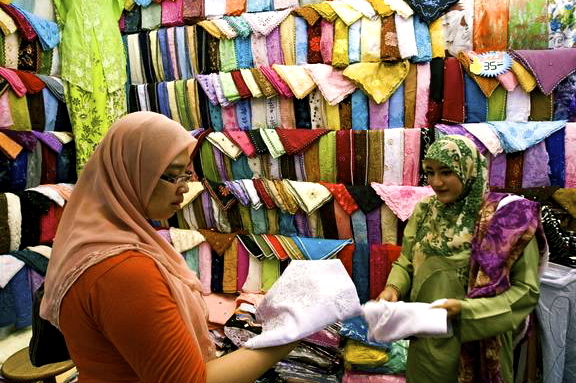 But non-Muslim tourists are often confused about the polite way to behave with Muslims during Ramadan; what tourists are permitted to do, or not do; and tourists wonder which stories they hear are true, or not true. It IS actually true that Morocco’s laws prohibit “a person commonly known to be Muslim” from “violating the fast in a public place during Ramadan.” It is called the Ramadan Law, and is under Article 222 of the Moroccan Penal Code. (This law also applies to Muslim tourists coming from known Muslim countries, such as Saudi Arabia, if they were to flaunt the fast in public.) The penalties are from one to six months in prison and a fine of up to approximately 100 Euros. The law states that the only Muslims who are exempt from this requirement are children, the elderly, the sick; and pregnant, lactating or menstruating women. Sometimes one can read about small protests that take place in Morocco against this law. The truth is, while this law is on the books, people are rarely prosecuted. Usually, if there is a token protest, the police do their best to try to prevent the protesters from arriving at the protest location, instead of arresting them. Remember, it is NOT forbidden by law to EAT during Ramadan (even though it IS socially unacceptable for Muslims who should be fasting), which means that Muslims who decide not to fast in their own homes will incur no penalties (other than sin against God). The law is very specific saying that Muslims “shall not violate the fast in a PUBLIC place.” Keeping the fast is difficult, and becomes much more difficult if people actively break it in front of others who are fasting. Therefore, the reason for this law is two-fold: to make it easier for those who are fasting, as well as to both teach the young, and communicate the idea to all Muslims that breaking the fast is most definitely not socially acceptable. This goes right along with several other laws in Morocco which prohibit certain behavior IN PUBLIC PLACES by Muslims (discussed below). The whole key here is PUBLIC PLACE. Let’s explore what this means. Children are not required to fast at all, although older children (8-12) might be encouraged to try it on a couple of special days during the month. But no child is FORCED to fast those days. Those who do usually try hard to get through the day because it gives them the feeling of being “grown up.” They see the adults doing it, and they want to be part of that adult world, to feel respected and admired for doing so. Younger children would never be encouraged to fast, even on those one or two special days. They are still growing and Islam clearly recognizes that fasting is not good for their growing bodies. If you go to a semi-private location, such as a swimming pool at a private club, you will find all the Muslim mothers feeding their children during the day, and no one objects to this. But they are not eating out on the public street. Muslim mothers certainly feed their children at home during the day, as well. The elderly DO fast. Elderly people fast unless they are in extremely poor health. In many cases, doctors even advise them not to fast, but many of them do it anyway. They do it because they feel there is moral value in fasting, and in many cases, it is a case of self-respect. Some very elderly or infirm people give up fasting, but very rarely. Sick (or injured) people are not to fast. The question becomes how sick or injured one must be. If blood comes out of one’sbody, such as if someone cuts themself in the kitchen with a knife accidentally, that would invalidate their fast for that day. But the question is how much. Suppose a man gets a tiny knick from his razor, is that enough to invalidate the fast? Supposedly not. But since that becomes questionable depending upon the size of the knick, many Muslim men shave in the evening during Ramadan, just in case. People with serious health conditions such as diabetes can fast and are encouraged to do so if their illness is not severe and they have it properly under control. Those with more advanced or severe diabetes are often told by doctors that they should not fast, yet some of them do anyway. It seems to be a question of pride (or even showing off to others that they “can” do it) and maintaining respect both in their own eyes and from others, particularly if they are not old. Some diabetics insist on fasting and even fall into comas because of it, yet continue to fast anyway. 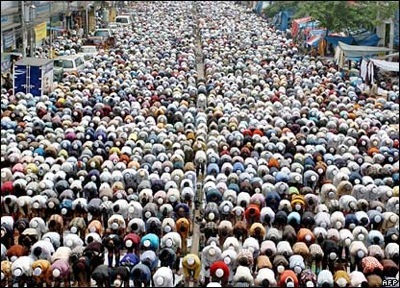 Most Muslims, if questioned about these people insist that they most definitely should not be fasting. People who are just a little bit sick (a light cold, headache, even sore throat, or ear infection) still have to fast. If someone had a fever, they would be excused from fasting. Malingering, when someone is just very slightly ill or not feeling their best is definitely not an acceptable excuse. Pregnant women are not supposed to fast, but in fact, many do. This is because pregnant women are supposed to make up the fasting days later in the year on their own. The explanation given by some Moroccan women for fasting while pregnant is that, “I would not be able to make up all those days on my own.” However, this behavior is most definitley not condoned by Islam. Lactating women are not supposed to fast either, and are also required to make up the days on their own. Menstruating women are not required to fast. Most women find these days a welcome break during the middle of fasting. However, if they are working in a company with mixed Moroccan and foreign workers, they will not join others in the lunchroom who are not fasting, even if they themselves are eating during those days; instead they wait, and eat at home. The reason is interesting. They say that if a man at their workplace sees them eating, he will know it is their time of the month. They say they don’t like their male co-workers knowing this personal information! Therefore, they don’t eat at work. They must also make up those fasting days later in the year. There is one guide book about Morocco which says something which is completely wrong. It says that in the days before Ramadan, you start to see some of the women and older people fasting a few days before Ramadan, in order to “practice” and be habituated when Ramadan starts. This reasoning is wrong. What IS correct is that they are making up missed days from the year before, as those days need to be completely made up before the new Ramadan fast begins (or they are answerable to God for each day not made up). Some elderly people could be making up days they missed. A few, extremely devout people do fast a few extra days, as they feel they will earn “extra points” with God for doing a few extra days of fasting. 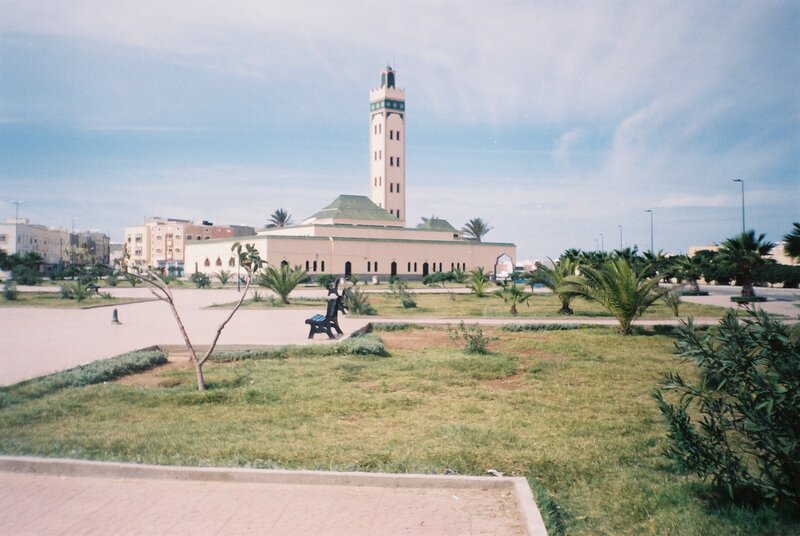 The Ramadan Law is not the only law relating to public space in Morocco. A similar law (and similarly confusing to many tourists) is about alcohol. In places like Agadir on the boardwalk next to the beach, or in bars located in other cities, there is sometimes an outdoor section where clients can sit and order drinks. In some locations, tourists can order a beer or glass of wine and drink it while seated in the outdoor section. While Muslims can also order a beer or glass of wine (except during Ramadan or other Muslim holdiays when it is strictly prohibited), they must sit inside to drink it. Those Muslims who are sitting outside are only drinking coffee or other non-alcoholic drinks. Is this hypocrisy? Most tourists think so. However, Moroccans feel it is proper because being a Muslim country it is more offensive to Muslims in the street to see other Muslims consuming alcohol than it is for them to see non-Muslims consuming it. It is a bit like vulgar words being bleeped out on broadcast American TV. Everyone knows they are saying vulgar words, but at least Americans don’t have to hear those words. It’s a similar situation. Muslims in the street know that others are inside consuming alcohol, but at least they don’t have to see other Muslims doing it. The Ramadan Law has a similar reasoning. People can eat if they want to, but if you’re Muslim, you are just forbidden from doing so in PUBLIC. Understanding these factors, what should non-Muslim tourists do? Out of respect, they should follow similar behavior as Muslims who would be diabetic, or ill, or pregnant. These Muslims would eat at home. If they were sick while out somewhere, yet needed to eat or drink, they would go in a private place where no one would see them (a few people might go into a restroom if there were no other place, but only as a last resort). Very few restaurants would be open during the day, but tourists would find a few, primarily in hotels. Both Muslims and tourists could buy water at a shop, but should not just open it and drink it in front of everyone. Instead, they should find a place to drink privately, not in public. (One Moroccan Muslim man was attacked in Fes two years ago by civilian vigilantes for drinking water in the medina street, arrested, and subsequently released when his family proved he was diabetic. But it’s clear he was pushing the boundaries of acceptable behavior, and would have known it. He could easily have explained in advance he was diabetic, and asked anyone if there was a private place where he could sip his water.) So this is no reason for tourists to be alarmed. If a tourist and were openly eating and drinking during Ramadan, people would most likely just give him dirty looks, understanding that he was a tourist. But the polite and respectful thing to do would be for him to eat and drink well before going out. It is advisable for tourists to take water in their bag, by all means, but just find a private place to drink it. If a tourist needs to eat, he / she shouldn’t do it in public. It’s perfectly acceptable for tourists to eat in any restaurant you find that is open, and these are most likely to be found in hotels or known tourist locations. Ramadan can actually be a very interesting time to visit a Muslim country. After dark, families go out late, and plenty of interesting things go on until quite late in the evening. Just be considerate of people during this month. The Ramadan Law is actually just asking (and ensuring) that Muslims also continue to treat each other respectfully. Are you wondering what there is to see and do in Ad Dakhla, Morocco besides kitesurfing? Dakhla also referred to as Ad Dakhla is a fishing and surfing paradise which was once the capital of the Spanish province of Rio de Oro. 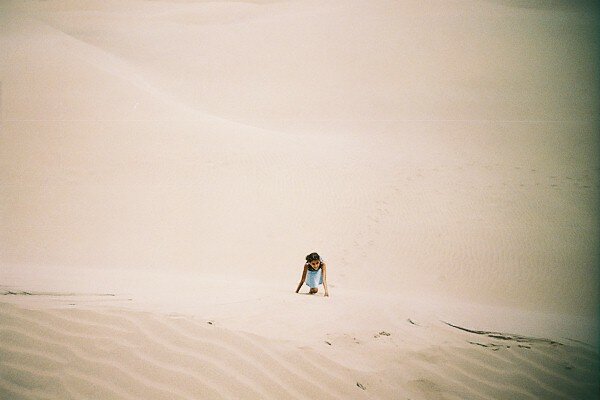 Dakhla or Ad Dakhla is one of the ultimate places to go where you can witness unspoiled Sahara Desert scenery. Visiting Dakhla is ideal for Moroccan travelers who want to get away from the crowds and visit a place where it is still possible to see the authentic nomad lifestyle nearby. Another place in Morocco where it is possible to see the authentic Nomad lifestyle is in the Bouthgrar region near Mount Mgoun which is often referred to as the Valley of Nomads. The Valley of Nomads can be visited from en route from Ouarzazate when passing the Valley of Roses. It is possible to fly to Dakhla however an overland trip in a 4×4 Landcruiser is ideal to get the real feel for the Western Sahara of Morocco. 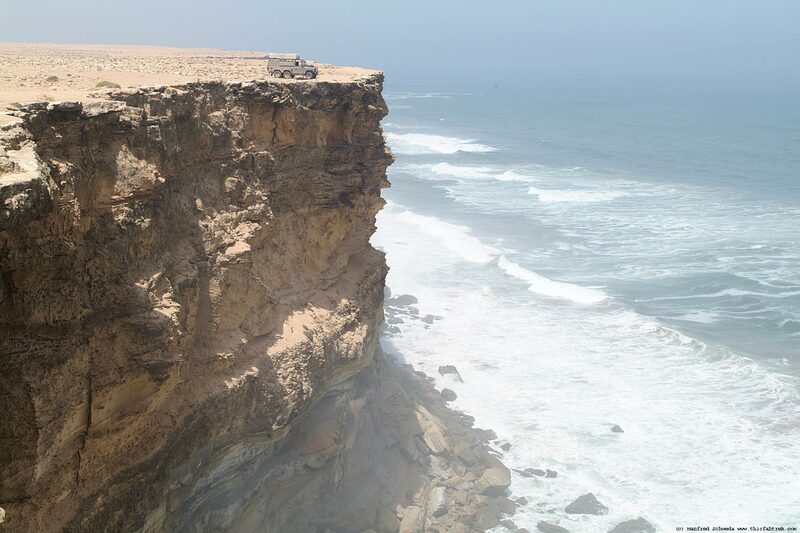 The road to Dakhla hugs the cool sea coast where there are some spectacular low cliffs that hang over the Atlantic Ocean. Sometimes local fisherman live in huts on the cliffs. If you can only visit the Sahara Desert in the summer, Dakhla is one of the ideal Sahara Desert tours, rather than the inland Sahara Desert of Merzouga, M’hamid or Zagora which do not have the advantage of the cool Atlantic ocean. It is possible to visit Dakhla on your own or take a 4 x 4 private tour or luxury tour just south from Agadir or Laayoune, all the way to Dakhla. The cold Canary Current off the coast means that the seacoast road (even in July and August) is quite cold most of the way (foggy in the mornings, and 75°F/25°C in the afternoons). In a couple of places, en route to Dakhla, the seacoast road juts inland, into a couple of Saharan towns, where the temperature can shoot up to 120°F/49°C. But it only takes 30 minutes to drive in and out of these areas, and is a fascinating experience to see how quickly and dramatically the temperature changes just a few kilometers in from the seacoast. It also makes clear why most of the road does hug the seacoast. The hot inland excursions are a great reason to make your trip in a comfortable and air-conditioned 4 x 4 to Dakhla. Driving down to Ad Dakhla, there are several great areas of sand dunes, between the road and the ocean which make great places to climb on. They are close enough to the ocean to be cool in the mornings. 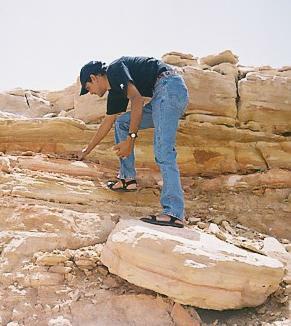 Anyone with even a passing interest in geology will find the trip to Dakhla interesting. Here we collected some naturally occurring gypsum crystals that we found ourselves in a place where we merely stopped to admire the scenery. Driving down to Ad Dakhla, you are able to drive for great distances without finding any small towns, stores, gas stations, or other evidence of civilization. When you finally arrive in Dakhla, it feels like a secret still-undiscovered oasis. 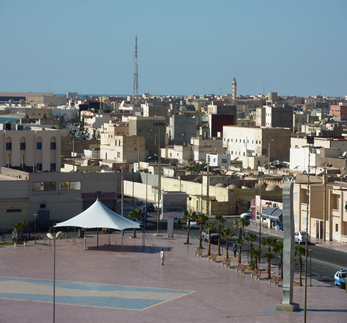 Dakhla, has a population of 70,000 and is Morocco’s largest southern Sahara city. Formerly known as Villa Cisneros (founded by Spanish settlers in 1502), Dakhla is located just north of the Tropic of Cancer, 550 kilometers south of Laayoune, and 1000 kilometers south of Agadir. Tourists in Ad Dakhla can enjoy deep sea fishing, fishing from shore, windsurfing, camel riding, visiting an oyster farm (8 km outside of town), and kitesurfing, in addition to year-round sun. 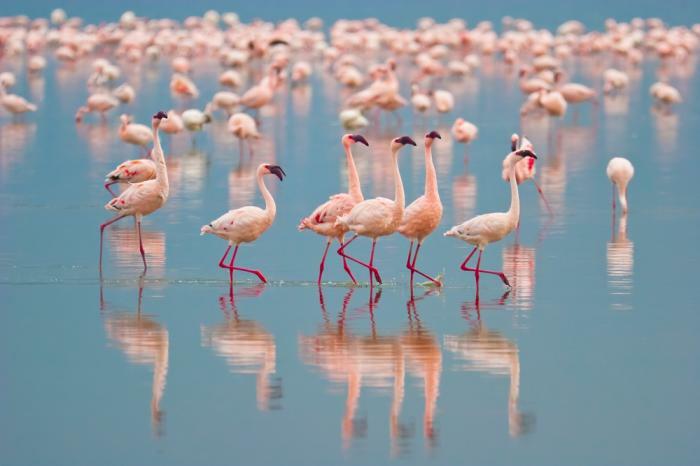 Excursions to the famous White Dune in the Bay of Dakhla are popular, where sometimes pink flamingoes can be found. Deep sea fisherman find that common fish of the area include chad, borinto, mullet, sea perch, marlin, tuna and swordfish. 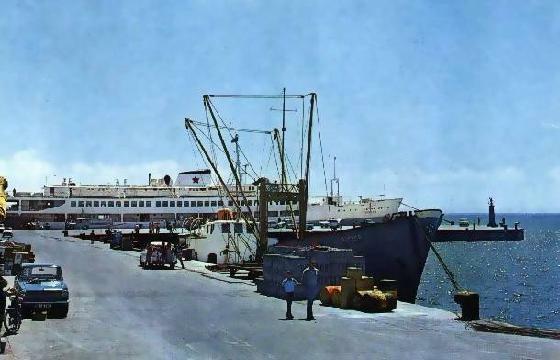 The new port is now home to one of Morocco’s largest fishing fleets. 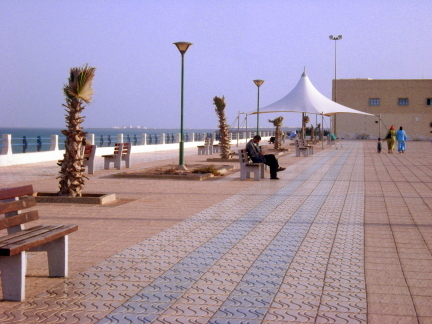 In Ad Dakhla itself, there is no beach (located in the lagoon about 25 km north of Dakhla, which you will see on the way in to town), but there is an oceanfront promenade. Ad Dakhla itself makes an interesting destination in the Moroccan Sahara for tourists who enjoy vast stretches of beach without crowds. Dahkla is located on a pennisula, and while there are no beaches in the town, very interesting beaches are located in the inland lagoon of water, actually on your left side, which extends for 50 km as you approach Dakhla from the north. These beaches are vast and shallow, where at high tide the water comes nearly to the road. Yet, at low tide, you can walk out nearly a kilometer. A wide range of migrating birds and other wildlife are all over the beach in Dakhla, looking for sand crabs and other delicious morsels to eat. It’s an amazing experience to be able to walk on a vast nearly flat beach empty of humans, yet filled at times with a wide range of migrating birds and other wildlife, looking for sand crabs and other delicious morsels to eat. Occassionally you can find tracks through the wet sand of other small animals. 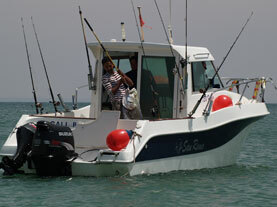 Dolphins can also frequently be seen in the Bay of Dakhla. 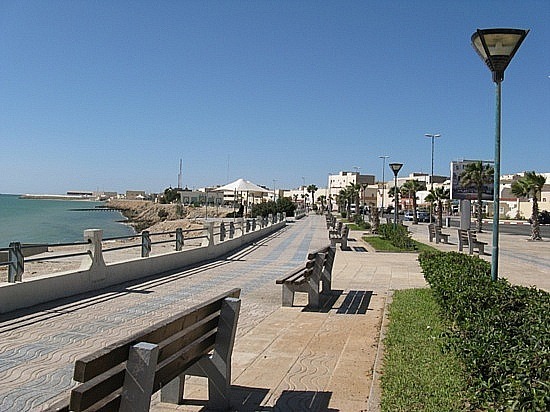 The town of Dakhla itself is a nice place to wander around. The Catholic church (left) was built during colonial times. A small souk is also interesting to visit. 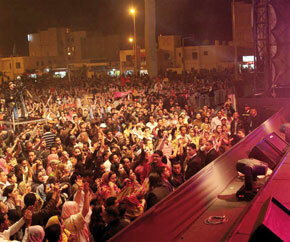 If you happen to visit Ad Dakhla in February, you can attend their large music festival. The Erg Chegaga Dunes of Morocco are the perfect place for a Sahara Adventure allowing Moroccan Travelers to escape the city lights and find themselves literally in the middle of no where. Erg Chegaga is considered by many to be the “real” Sahara Desert with it’s authentic rustic colored sand dunes and unique flora and fauna. Until recently cell phone coverage was not available in Chigaga and a Sahara journey to the Erg Chegaga Dunes was intended for those who wanted to discover the rocky and desolate areas of the Sahara. Historically speaking, the French and the British were primarily interested in visiting Chegaga however in the past several years that has changed. Americans, Europeans, Asians, Africans and also Moroccans who are interested in an authentic Sahara Desert adventure that takes them deep into the vast Sahara frequent Morocco’s Erg Chigaga Dunes. Centuries ago, the Sahara Desert was covered with water that flowed through and over it. Morocco’s Sahara akin to its rocky piste region of the Onila Valley and Telouet were created by the geologic submergence of water and wind that pressed up against its basalt rock and has today created some of what make up the most magnificent landscape scenery in the Maghreb. The result of this deluge of water created a Sahara Desert of artifacts found near remains of giraffe, elephant, buffalo, antelopes, rhinoceros, and warthog, as well as the remains of fish, crocodiles, hippopotamuses and other aquatic animals. According to archeologists, the Sahara was much more densely populated thousands of years ago when the desert’s climate was not as harsh as it is today. 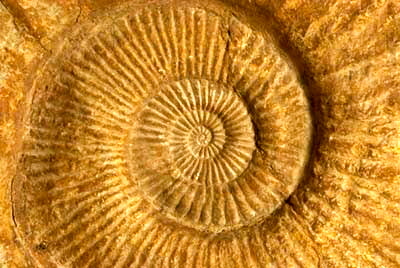 Fossils, rock art, stone artifacts, bone harpoons, shells and many other items have been found in areas which today are considered too hot and dry to inhabit. The Sahara is the world’s largest non-arctic desert, and technically the world’s third largest desert. At over 9,000,000 square kilometers it covers most of North Africa, almost equivalent to the size of the United States of America. The Sahara desert stretches from the Red Sea, including parts of the Mediterranean coasts, to the outskirts of the Atlantic Ocean.The Sahara has a history that can be traced back to over 3 million years. 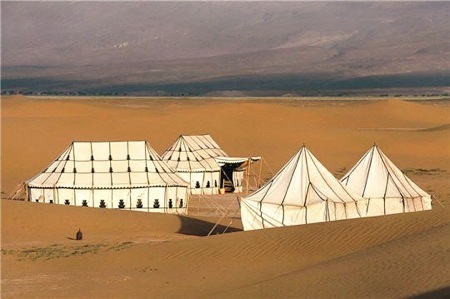 Erg Chigaga is the only authentic Sahara Desert where the Erg Chigaga dunes lie within a wilderness where the only accommodation is in desert camps. This region is home to the Ait Atta Berber nomads. The Berbers are one of the oldest known inhabitants of the Sahara Desert. They are the people that occupied (and still occupy) more than two thirds of the Sahara’s total surface. 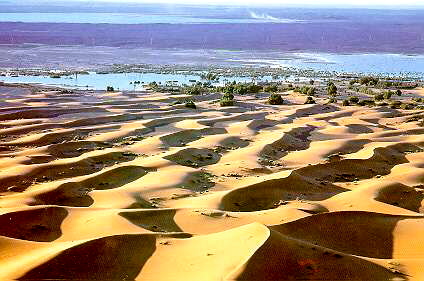 The Erg Chigaga Sahara Desert is not built up in the same way as the Merzouga Sahara & Zagora Sahara. Aside from sand dunes and camels, there are only nomad families, wells for water usage, one school, twisted tamarisk trees, apple trees, the Black Sahara (hammada), Iriqui salt flats and Sacred Heart Oasis. Erg Chigaga is for the dye hard Sahara Desert Travelers. ►Your Driver will pick you up at your Riad/ Hotel in Ouarzazate at 9:00am to travel to Morocco’s Erg Chegaga Sahara Desert in a 4×4. ►Visit Kasbah des Cigognes which offers a panoramic view of the lake. Continue the road through the Draa Valley, passing Agdz. Once in Agdz continue the road by piste through the Tizi n’Tinififft Pass. ►Have lunch in local restaurant. ►After lunch cross directly through the Draa Valley and witness its incredible volcanic rock, plantations of palmarys and ksours. Arrive in Zagora. 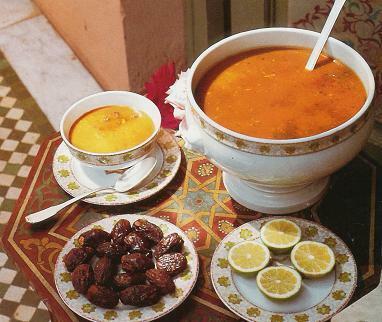 ►Diner and Spend the night at a Riad located within the palmary of Zagora. ►Breakfast at your Riad in Zagora. ▶Visit the old Kasbah Ait Lkaid in the village of Amzrou. 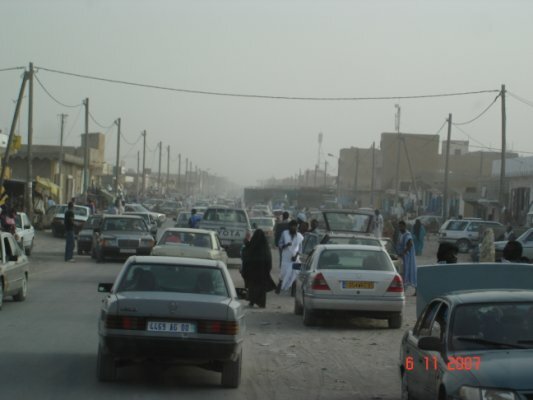 At the end of the main road you will ﬁnd the famous road sign to Timbuktu that reads “52 jours” – 52 hours by camel. ▶Next visit Zagora’s unique, beautifully glazed forest green pottery at the local cooperative in the desert town of Tamagroute. The holy village of Tamegroute’s claim to fame through out history is the beautiful pottery created that has a glaze made of henna and is sun dried. ▶Visit the old Zaouia in Zagora and its underground channels where people live and work. ▶Before taking the road to the Chegaga Sahara Desert, visit he Koranic Library that once held 40,000 volumes and theological college dating from the 11th century. The library contains a collection of illuminated Korans, the oldest of which are written on gazelle skins. ►Take the road to M’hamid. Have lunch in the M’hamid Sahara Desert. ▶ Continue the road by piste to Erg Chegaga then go by dromedary camel trek for 1 hour at sunset into the Erg Chegaga Dunes to camp overnight in a Biouvac tent. 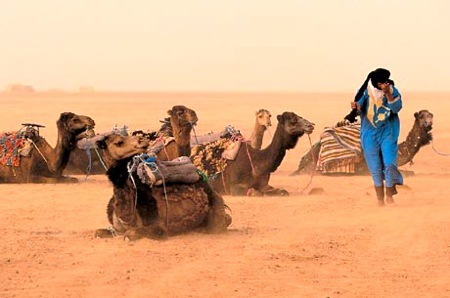 Your Tuareg guide will share some of the Sahara Deserts’ secrets. As you glide across humpback on these silent, mystical dunes there will be countless opportunities to photograph the endless rolling dunes. ▶Breakfast in the Erg Chegaga Dunes. Then take the road to Foum Zguid. You will pass deep, desert landscapes, dromedaries along side Nomad families that live in tents. ▶Visit Iriqui, the dry lake and Sahara desert plateau of Akassia. Enjoy lunch at an Oasis. ▶Take the road through Tazenackt, the region that is famous for Berber carpets. Then continue the road back to Ouarzazate This ends your Sahara Tour & Camel Trek to the M’hamid and Erg Chegaga Sahara Dunes in Morocco’s Sahara Desert. ►Your Driver will pick you up at your Riad/ Hotel in Marrakech at 9:00am to travel to Morocco’s Erg Chegaga Sahara Desert in a 4×4. 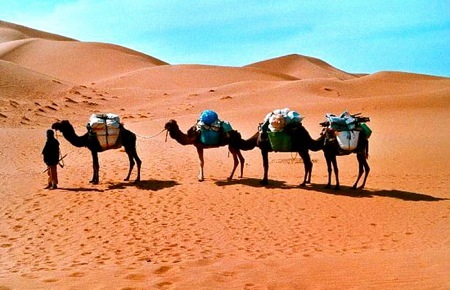 ►Departure from Marrakech to M’hamid Sahara Desert. ►En route from Marrakech to Zagora, stop to visit the Argan Cooperative where women make Argan Oil, Argan butter and cosmetics. Have a complimentary tasting and sample the products. ►Stop in the Tizin’ Tichka Pass, which boasts breathtaking views of the Tichka region as you continue your journey to the Sahara Desert for tea. ►Arrive in Ouarzazate. Visit the Ait Benhaddou Kasbah. Lunch in Ait Benhaddou at a restaurant with views of the Kasbah. ►Take the road by piste to visit the picturesque village of Aït Benhaddou located 32 km from Ouarzazate. Aït Benhaddou is situated in Souss-Massa-Draâ on a hill along the Ouarzazate River. Lawrence of Arabia was filmed here and Orson Welles used it as a location for Sodome and Gomorrah; and for Jesus of Nazareth the whole lower part of the village was rebuilt. In recent years more controlled restoration has been carried out under UNESCO auspices. Aït Benhaddou is one of many locations in this region used for shooting Hollywood films. ►Your guide will lead you on a private tour through this Berber village of towered and crenulated kasbahs that once guarded the lucrative caravan route through the Atlas Mountains. Explore the kasbahs by foot with the option to ride a donkey across a river. ►Your guide will share the fascinating history of Aït Benhaddou, which once served as the former caravan route between the Sahara and Marrakesh in present-day Morocco. Most of the town’s inhabitants now live in a more modern village at the other side of the river; ten families however still live within the ksar. ►Aït Benhaddou was once a significant stop for traders carrying gold, salt and slaves along the famous Southern Caravan route moving through the Sahara. Only six miles away, is the village of Tamdaght, dominated by the canyon walls of a Glaoui Kasbah. The Kasbah is famous and you will find its towers inhabited by storks. Walk outside the Kasbah’s lush terraced gardens and witness the same desert scenery that used in Gladiator and Alexander the Great. ►Continue the road through the Draa Valley. Arrive in Zagora. ►Spend the night at a Riad within a Palmary of Zagora. 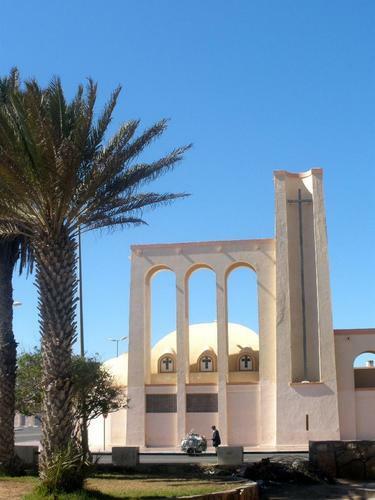 ▶Before taking the road to the M’hamid Sahara Desert, visit he Koranic Library that once held 40,000 volumes and theological college dating from the 11th century. The library contains a collection of illuminated Korans, the oldest of which are written on gazelle skins. ►Lunch in Zagora, take the road to the M’hamid Sahara Desert. Visit the M’hamid Sahara Dunes then continue the road to Erg Chegaga. ▶ Arrive in Erg Chegaga then go by dromedary camel trek for 1 hour at sunset into the M’hamid Dunes to camp overnight in a Berber Biouvac tent. 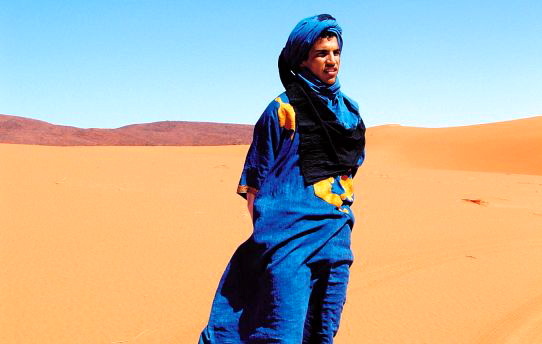 Your Tuareg guide will share some of the Sahara Deserts’ secrets. As you glide across humpback on these silent, mystical dunes there will be countless opportunities to photograph the endless rolling dunes. ▶Breakfast in the Erg Chegaga Dunes. Then take the road to Foum Zguid. You will pass deep, desert landscapes, dromedaries and Rocky Mountains. ▶Take the road through Tazenackt, the region that is famous for Berber carpets. Then continue the road by pise to visit Kasbah Telouet and its famous Pacha Glaoui. Kasbah Telouet was once an important stop on the Southern Caravan route for traders carrying spices, slaves and other commodities. Telouet’s Kasbah also known as Dar Glaoui once served as the royal headquarters and residence of the Glaoui tribe. Until Morocco’s independence in 1956, the Glaoui had power in the central Moroccan and French administration. ►Arrive in Marrakech in the early evening. This ends your Sahara Tour & Camel Trek to the M’hamid and Erg Chegaga Sahara Dunes in Morocco’s Sahara Desert. ▶Take the road to Skoura which is known for its Valley of 1000 Kasbahs. Visit Skoura. Dinner & Spend the night at a Guest House that has views of the Skoura Palmary and 1000 Kasbahs. ►Breakfast at the Guesthouse in Skoura. Visit Ait Benhaddou. ► Located 32 km from Ouarzazate lies the picturesque village. Aït Benhaddou of Aït Benhaddou is situated in Souss-Massa-Draa on a hill along the Ouarzazate River. Lawrence of Arabia was filmed here and Orson Welles used it as a location for Sodome and Gomorrah; and for Jesus of Nazareth the whole lower part of the village was rebuilt. In recent years more controlled restoration has been carried out under UNESCO auspices. Aït Benhaddou is one of many locations in this region used for shooting Hollywood films. ►Make sure to bring along your camera and photograph this spectacular site and the stunning views that surround this Kasbah and its crenellated towers and dark red pise walls. By the river, you will find observe a collection of Kasbahs whose walls are decorated with blind arches and geometric designs. Make sure to take a walk behind the Kasbah and visit the series of ksars, individual plain earth houses still inhabited by Berber families. Your guide will share the fascinating history of Aït Benhaddou which once served as the former caravan route between the Sahara and Marrakech in present-day Morocco. Most of the town’s inhabitants now live in a more modern village at the other side of the river; ten families however still live within the ksar. Aït Benhaddou was once a significant stop for traders carrying gold, salt and slaves along the famous Southern Caravan route moving through the Sahara. ►For lunch, relax on a terrace with clear views of Aït Benhaddou. and enjoy a traditional Moroccan tajine. After lunch, browse the village shops then climb back in the comfortable air-conditioned/heated 4×4 and head to the village of Tamadaght. ►Next take the road back to Marrakech, passing the Tiz N Tichka Pass with its impressive High Atlas Mountain views. ►Enroute stop at the Argan Cooperative where you can see women make Argan oil, butter and cosmetic products from the Argan nut. Continue the road and arrive in Marrakech in the early evening. This ends your Travel Exploraiton Morocco Sahara journey.